A popular destination for tourists, surfers, and Connecticut teachers avoiding the snow, the island of Oahu offers a dependable climate and guaranteed relaxation. However, for the locals, innovative educational opportunities often seem anything but a sure thing. 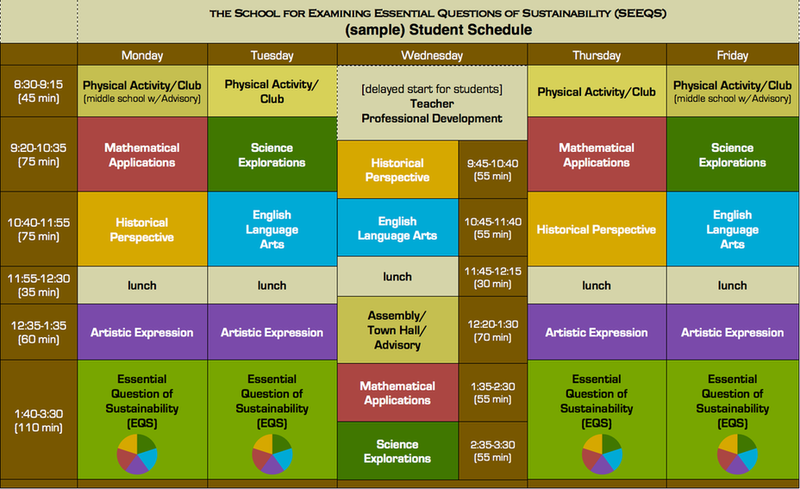 Enter SEEQS, a middle school in its second year with a focus on project-based learning and sustainability. A public charter school in Honolulu, SEEQS is buried in a neighborhood and operates out of reclaimed community buildings. While the physical space is ideally temporary, teachers have placed the focus on the process and metacognition behind learning. It’s been a while since I’ve been taller than most people in a school, but students were eager enough to literally bring me down to their level to chat about their work, whether it be at a table, on a patch of carpet, or on a bench in the breezy courtyard. SEEQS walks trodden paths in some respects, but blazes forward in others, embracing the classic charter mentality of challenging the norm. School Leader Buffy Cushman-Patz welcomed me into her office and after hearing about Greenwich High School’s Innovation Lab endeavor, we chatted about the project cycle her students go through, from design to implementation to presentation. Often, traditional students only get limited choice in implementing a project, with teachers designing it and controlling how it’s presented. At SEEQS, students ideally complete all three (with necessary support). 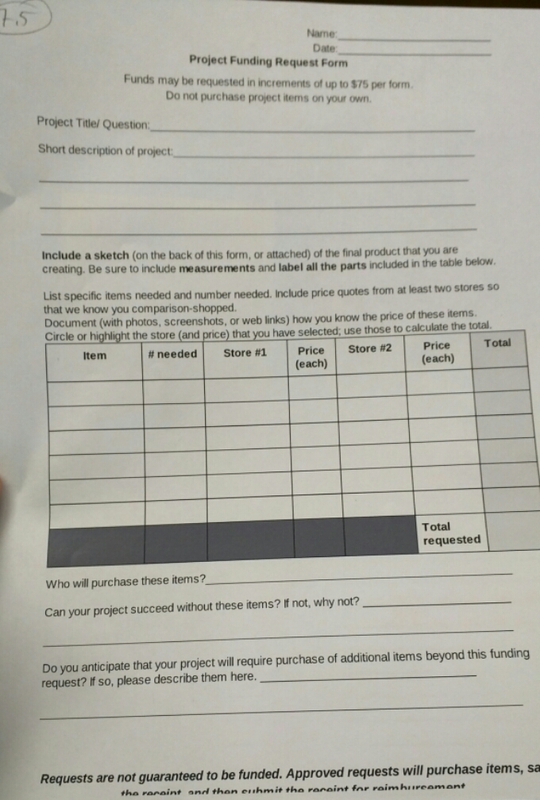 I like the idea of assigning project budgets and reimbursing students for project supplies. An important caveat – sticking to a budget levels the playing field for students from different backgrounds and if the ones who don’t need it don’t submit reimbursement, no big deal. I grew jealous of her ability to order from outlets like Amazon instead of only approved vendors, an advantage she has as a charter. I walked away confirmed in my thought that the ordering process in our own school could use some revision and that it would be worth starting the conversation for the benefit of Innovation Lab students. Behind Buffy’s desk sits a color-coded schedule and a quick look reflects tenets of their school – longer class periods, close connections with adults and community, time every day for student created projects, multiple hours built in for teacher collaboration and prep, and a later start and end time (8:30-3:30). When Mark Hines from eXploratory over at Mid-Pacific recommended I visit SEEQS, he did so because of their unique schedule and its parallels to Innovation Lab plans which included similar designations. Students cover subject-based topics three times per week, have an art block that often includes digital forms like image editing, and have time built in for team-building activities every morning. Classes I saw involved students looking up and recording weather information, working on Geometry problems, and looking for quotes to support how characters felt in a novel about a South Korean family immigrating to America. The school is one-to-one and fully inclusive, so there’s a big technology focus and special ed teachers float in and out of classes naturally. These are all great aspects of the school, but they’re not what make SEEQS unique. The nearly eight hours per week devoted to student-generated projects around questions of sustainability is unparalled, and they’re doing it with students who aren’t even teens yet. Each semester starts with a question – the two for this year are “How does water sustain us?” and the a second references the famous Hokulea, a Polynesian double-hulled canoe that originally brought the first settlers to Hawaii. Students are divided into two groups and each covers one of the two questions, flip-flopping mid-year. A girl approached me at lunch and wanted to describe her first semester project which detailed pollution levels at different areas of the Pacific. She couldn’t collect the data herself, but she emailed someone she found in an article who did and used it as part of her project. Another student was interested in what makes the Hokulea float and his “coach” (their vocabulary is very deliberate) and I mentioned he might want to look at density levels of wood and into the specific reasons the Polynesians chose what they did. Mondays are weekly check-in days, one part of an intricate scaffolding process that helps students stay on track and set weekly tasks and goals. I sat in on a group discussion between a coach and his team of 12 or so students. Each shared their idea and received “push back” from others who were encouraged to push the idea forward. Students can work in ones, pairs, or threes, but are encouraged to complete separate research and bring it together mid-project. The work time is very free form. While there are quiet areas and their coach is available, students roam outside with their Chromebooks and are left to their own devices. (Google Classroom does include a screen view feature, but teachers acknowledge they’re often supporting students and not looking over their shoulders unless a substantial issue arises.) Only two students didn’t finish a project last semester. A pair of students told me the weekly check-in prevents students from goofing off too much and it’s apparent that complete choice in a project gives students an entry point with more buy-in than many students ever get in other schools. Constantly, fellow teachers say giving students that sort of freedom is a disaster waiting to happen and I can say that students consistently disprove that notion. They need choice, a real audience to whom they present work, and teachers who value the process as much as the product (teachers often claim this, but do not reflect it in grades). 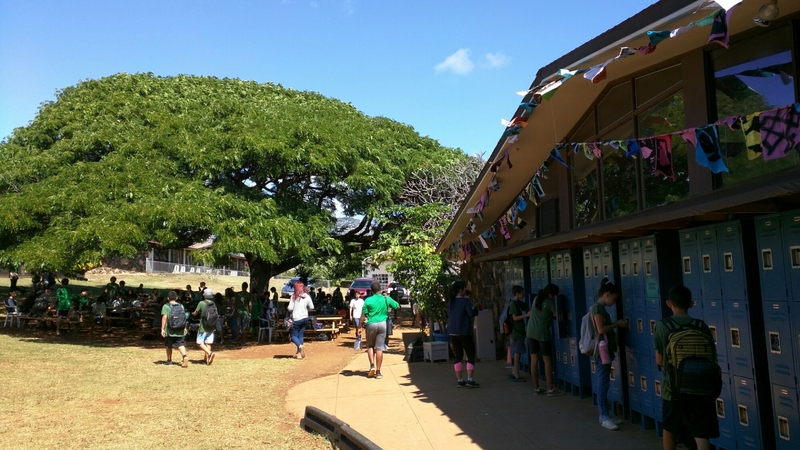 As the day wound down, every student and teacher participated in a ten minute clean up. I looked on in awe as they watered trees, swept the walkways, put away supplies, and restored order to their environment. Only then did I realize I hadn’t seen a custodian all day. The day drew to a close when all students and teachers gathered to stand and sing a Hawaiian tune under the tree in the courtyard. As I looked around and was reminded of faint voices reciting the Pledge in our own school, I was taken aback in hearing the full voices of everyone present. It was an impressive show of community and a reminder that there is something truly special floating around out here in the Pacific.